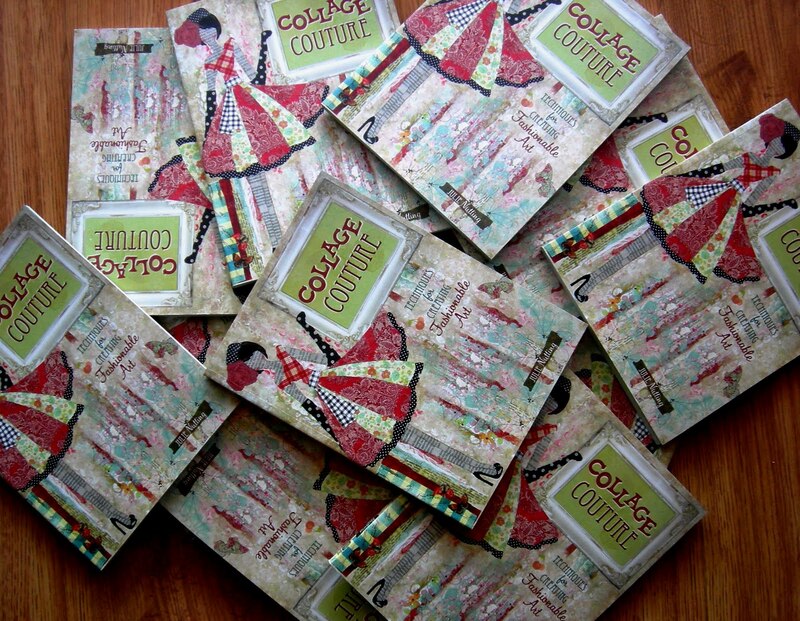 Julie Nutting Designs: Blogaversary Giveaway! Well this is it! My blogaversary! Yep, I started it a year ago, kicking and screaming. Who would read this and why would anyone want to read what I have to say! You all know what I'm talking about! This was single handedly the most difficult part of my creative journey...putting myself out there. But I was told I had to. I was told by the Senior editor, Christine, from North Light Books that I simply had to. I supposed she knew what she was talking about, after all she was working for one of the top publishers of arts and crafts books. So I listened. Then I started. I tread lightly at first. How would I ever have enough to say? I'm shy, I don't even talk that much! But I forged ahead with it. It was kinda fun. I kinda liked it. I had stuff to say! I had stuff to share! I remember my 4th follower! I remember my 16th. Hey, people might just read this! I remember a post where I whined big time and a reader made a comment and really felt sorry for me! We exchanged phone numbers and met at her house. Some of you might remember my first meeting with a blogger stranger in Laguna Beach. Paulette and I became great friends. Looking back, I can't believe the tangled web of people that stemed from this meeting. There was Beth, editor from Stampington that was led to Paulette's beautiful treasures at the beach. There was Jenelle who started at the little cottage in Laguna and has ended up in the vintage fou fou crowd. There was Juliette, who visited from Wisconson and ends up being one of Lisa's favorite artists now. The web of people in blogland get tangled in all directions. There was Crystal, I worked with her sister and she was led to Beth, published in a Stampington magazine, then ended up with the vintage fou fou crowd. Christine was my 3rd follower who was in my class at Urban Barn, whom I saw last weekend at The Vintage Marketplace, who went to the Lavender farm with the vintage fou fou girls. I didn't even know she was part of the vintage fou fou crowd! Oh the places you go in blogland. There was Elena, who invited me to Key Largo to teach at her retreat. Now I see Eileen, who was at the retreat and is from NYC, is on so many blogs that I follow. Or I'll meet someone at a show and they give me their card and when I look them up, guess whos on their bolg? Yep, Eileen! 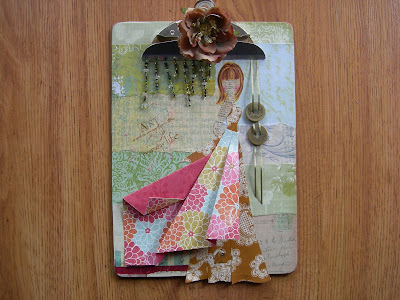 I suppose it's all those fancy Tim Holtz cruises she goes on! It's been fun looking back at the followers and comments, then connecting the dots. If it weren't for blogland I would've missed out on so many things this past year. Great times, Great friends. So Happy Blogaversary to me! And to celebrate, I am doing a giveaway. My first! Just leave a comment and I will put your name into a hat. If you have my blog connected to your blog, I will put it in twice! And what will the winner get? 1st prize- My book Collage Couture. What? You already have it? Don't worry, give it away as a gift and there will be another little something with it! Happy blog anniversary! I am enjoying your new book. Happy Anniversary! I am SO glad that you did take the chance and put yourself out there. The world is a more beautiful place because you have shared your phenomenal talent. Thank you! OOOHHH OOOHHH OOOHHH!You KNOW how I love you and your work Julie!Thanks for the chance to own another piece of it!I'm LOVING the book as well!!!! !Happy Blogaversary! Congratulations on you year anniversary of your BLOG. That is fabulous. Oh, yes and I want to enter your give-away! What wonderful prizes yu are giving away. I would love to win one of them!! Just stumbled upon your beautiful work through "Pinterest." And what luck that today is your blogaversary! Congrats on your success...can't wait to see and read more. I cant express how fabulous your work it!!! It is amazing!! I was invited to your blog through a great friend that bought your book. I must say I was taken away with the fabulous designs!! I would love to entered for a chance to win a copy of your book!! Thank you so much for sharing your wonderful talent with the crafting public, and thank you so much for hosting this awesome giveaway!! Hi Julie! I check out your blog regularly but I didn't realize I hadn't clicked to follow yet. Sorry about that. Blogger has been acting up so much lately so who knows! I enjoyed having my space next to you at The Oaks. Next time we'll make sure that umbrella stays put! And I'll make sure I have an extra chair too! Ha-ha! Love the giveaway! Have a super blessed week! Happy Blogaversary Julie. I am linked to your blog already and your book should be arriving at my house any day now! YAHOO! But I would love to give one away to one of my followers too! I love your art work, it is so lovely feminine! Happy 1 year! I am so inspired by your book. I bought it about two weeks ago and I am in love. It is a joy to read and learn from as well, so thank you for putting yourself out there and sharing your gifts and talent with the world! I don't have a blog that allows me to link to yours but I will continue to rave about your book & artwork to everyone I know :D Best Wishes to you! You've come a long way ! I am thrilled with all the successes and fun you enjoyed by being "brave". I always enjoy your art and gift for story telling. ❤ you Julie, happy blogaversary ! Happy Anniversary!!! I love you art! It is truly unique. Congratulations on your book too. My fingers are crossed that I win! Happy Anniversary! Your book has been an inspiration to me! What fun it is to come up with ideas and designs! I just love working on a new project with your book for reference! Thank you! Happy one-year Julie!!! Time sure flies huh? I can't believe I have been blogging for over 5 years now! It's crazy. I am so glad that I decided to do it too, as I'm sure you are. What a lovely giveaway! Please add my name to the hat. You know I adore your work!! Hope you're having a great week and I hope to see you soon. Happy Blogiversary, Julie! Congrats on the book. It looks fabulous! Happy Blogiversary! I just got your book...LOVE LOVE LOVE it! Can't wait to create something. Thanks for the chance to win. Happy blogiverary! I have been following you for a while now, and was about over the top excited to get your book...I just received my second copy yesterday...gave the first one to a dear friend...if I win this one, it goes to my oldest granddaughter...I know she will LOVE it! Hugs! Happy Anniversary that is awesome! Your such an inspiration to me and I am enjoying discovering your blog/book. Happy Blogaversary. Looking forward to getting your book next month from Amazon. You are a wonderful person and oh so modest. My girls still haven't seen the 'girl' I did at the Keys. Claire gets it next month for her birthday. XOX. I just picked up your book at Amazon this week, and I'm an instant FAN! AND SURPRISE to me... You're local! I'll be watching for you to update your calendar over there on the left. I really want to attend one of your shows or workshops! Thanks for the chance to WIN! Love your book!!! Love your blog!! Happy Bloganversay!! Thanks for chance to win one of your orginals!!! Happy Anniversary. How sweet of you celebrating you with us! Would love to have your book. Wow I really like these. I will have to watch to see when you do a class in NorCal again. Happy Blogaversary! Happy Bloggity blog Anniversary!! I just got your book in the mail yesterday. I would LOVE to have another copy! I could pass it on to one of my friends.... and they would LOVE it too! I've learned so much reading through it- and it was only for just a few minutes! I can't wait to read it cover to cover and learn so much more! You are great! Love what you do and hope you keep it coming! My dream someday - to be one of your workshops!! Do you think you will do any online workshops anytime SOON? Oh, just found your blog! I hope I can still enter in this fantastic giveaway! Would love a copy of your book! wow - happy blog-a-versary. COngratulations on all the great things that are happening for you especially your book. I don't own it yet but would love too. wow - I just found your book on amazon it looks so amazing. Congratulations on your blogaversary, I look forward to seeing more beautiful art in the future. I just found your blog. I have your book and love it. Congratulations on your blogaversary. Happy Blogaversary! I am so happy we were able to meet with Paulette in Laguna Beach! So beautiful and fun! A huge congratulations to you, Julie!